It's an idea that can change the world, and is the idea that is the backbone of Christianity - discover today just how much this one idea can change the lives of those around you. Want a fresh understanding of Jesus' message? "How we love is the most important thing to God, and love is fundamentally about relationship." At the heart of everything there is one very good idea – the true currency of our society, the key to all human flourishing and happiness. That idea is very simple. It is love, actually. Love God. Love one another. Your neighbour. Your enemy. Simple – but far from easy. As the statistics and prolific stories of broken friendships, toxic workplaces, divided churches, dysfunctional families and lonely people testify. And yet it is a commandment. Not just a good idea, but the most important one, the one from which all the others flow. … because putting relationships first transforms everything. 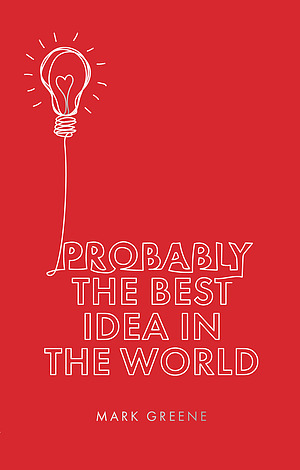 Probably the Best Idea in the World by Mark Greene was published by Muddy Pearl in March 2018 and is our 31504th best seller. The ISBN for Probably the Best Idea in the World is 9781910012550. Be the first to review Probably the Best Idea in the World! Got a question? No problem! Just click here to ask us about Probably the Best Idea in the World.